In 2006 airports offered little to no access to power for travelers needing to charge their mobile devices. Samsung viewed this as an opportunity and looked to Ken Jerome of Twelve Create LLC for a viable marketing solution. The result is a first of its kind display that promotes the brand through signage, product displays, and strategic use of a universal icon. 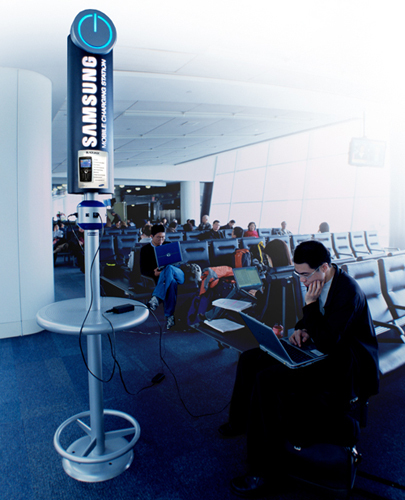 The design and intuitive function of the Samsung Mobile Charging Station has quickly made it an icon among travelers and promotes the brand as an innovative leader of the mobile communication industry.